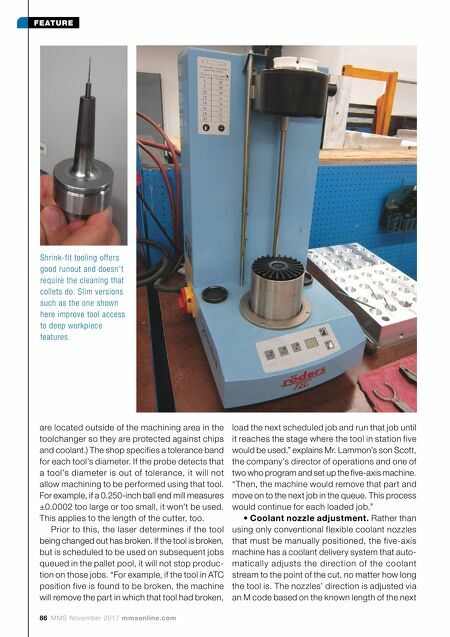 mmsonline.com November 2017 MMS 87 FEATURE tool that is installed in the spindle. • Auto-tilt programming function. Chris Claar is Phoenix Proto's engineering manager who also programs and sets up the five-a xis machine. He says in 2010, the shop performed a time study comparing its previous CAD/CAM software with Cimatron software. "We switched to Cimatron after our study showed a 30 percent programming-time savings compared to the other software," Mr. Claar explains. "One time-saving feature we appreciate is the five-a xis auto-tilt function. Because we have all machine compo- nents as well as workpiece, fixturing and tooling 3D-modeled in the software, the auto tilt function is able to determine at what depth the cutter or toolholder would hit the par t, and then auto- matically tilt the par t to prevent the crash and enable the operation to continue." The software also uses those 3D models to enable the program- mers to perform offline simulation of machining operations to detect potential crashes. • Syntax check. In addition to the program- mers running offline simulations in Cimatron for each program, they also use a synta x check function in the Roeders control that automatically proofreads the program and postprocessor to identify any errors before that job is scheduled. • Program re-start. If there is a need to stop the machine in the middle of a program, it is not necessar y for the programmer to manually go Phoenix Proto, call 269-467-8300 or visit phoenixproto.com. Roeders of America, call 845-680-7020 or visit roeders.de/en. Cimatron, call 877-596-9700 or visit cimatron.com. into the posted program, search for the line number at which the machine was stopped and then erase all the code above that so it restarts at the proper position at which it lef t of f. With the Roeders control, an operator simply enters the line number into the command file, and it will automatically read through the program and re-start from there. AUTOMATION PEACE OF MIND Although a good deal of thought went into Phoe- nix Proto's unattended machining strategy, it realizes that the unexpected can occur. That's why both the three- and five-axis Roeders machines are set up to send text or email alerts with error messages. It is also possible to remotely log in to the machines' controls via the online "Team Viewer" software, just as Roeders' service tech- nicians can perform remote machine diagnostics to get an idea if a component needs to be replaced, if a drive needs to be tuned and so on. (In fact, drive tuning can be performed remotely using this software, Mr. Byers says.) That said, the shop has another option. It has hung a camera from the ceiling between the two Roeders machines that its programmers can access via their phones to view what's going on (see the photo above). They can pan the camera and zoom in on a machine or its CNC screen to see (and hear) the status of jobs currently running. "As busy as we are now, I will check in on my phone certain times during the night, because a down machine can really put a wrinkle in our schedule," Mr. Claar says. "It's just like I'm stand- ing at the machine." 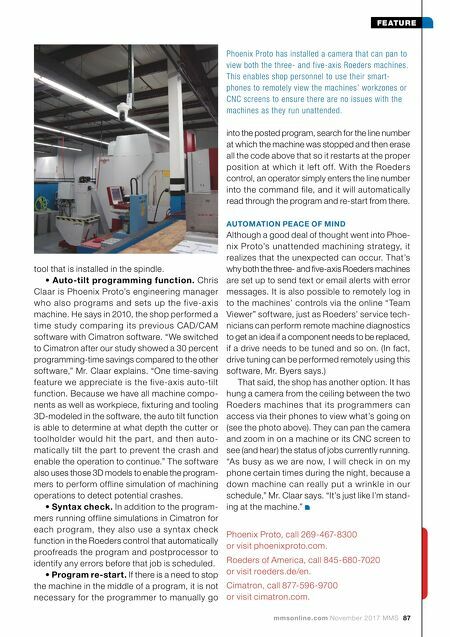 Phoenix Proto has installed a camera that can pan to view both the three- and five-axis Roeders machines. This enables shop personnel to use their smart- phones to remotely view the machines' workzones or CNC screens to ensure there are no issues with the machines as they run unattended.